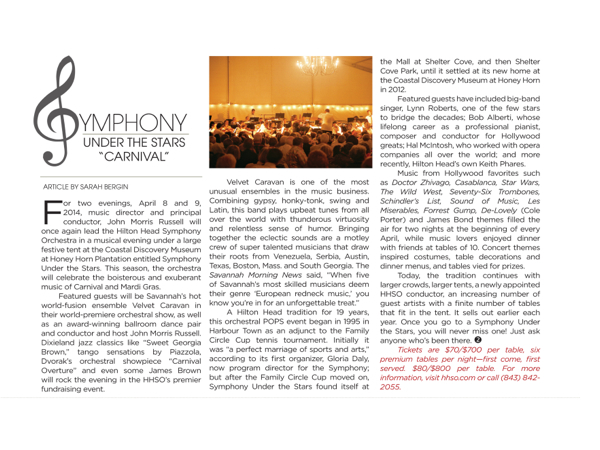 Hilton Head Magazines: CH2/CB2: Symphony Under the Stars "Carnival"
For two evenings, April 8 and 9, 2014, music director and principal conductor, John Morris Russell will once again lead the Hilton Head Symphony Orchestra in a musical evening under a large festive tent at the Coastal Discovery Museum at Honey Horn Plantation entitled Symphony Under the Stars. This season, the orchestra will celebrate the boisterous and exuberant music of Carnival and Mardi Gras. Featured guests will be Savannah’s hot world-fusion ensemble Velvet Caravan in their world-premiere orchestral show, as well as an award-winning ballroom dance pair and conductor and host John Morris Russell. Dixieland jazz classics like “Sweet Georgia Brown,” tango sensations by Piazzola, Dvorak’s orchestral showpiece “Carnival Overture” and even some James Brown will rock the evening in the HHSO’s premier fundraising event. A Hilton Head tradition for 19 years, this orchestral POPS event began in 1995 in Harbour Town as an adjunct to the Family Circle Cup tennis tournament. Initially it was “a perfect marriage of sports and arts,” according to its first organizer, Gloria Daly, now program director for the Symphony; but after the Family Circle Cup moved on, Symphony Under the Stars found itself at the Mall at Shelter Cove, and then Shelter Cove Park, until it settled at its new home at the Coastal Discovery Museum at Honey Horn in 2012. Featured guests have included big-band singer, Lynn Roberts, one of the few stars to bridge the decades; Bob Alberti, whose lifelong career as a professional pianist, composer and conductor for Hollywood greats; Hal McIntosh, who worked with opera companies all over the world; and more recently, Hilton Head’s own Keith Phares. Music from Hollywood favorites such as Doctor Zhivago, Casablanca, Star Wars, The Wild West, Seventy-Six Trombones, Schindler’s List, Sound of Music, Les Miserables, Forrest Gump, De-Lovely (Cole Porter) and James Bond themes filled the air for two nights at the beginning of every April, while music lovers enjoyed dinner with friends at tables of 10. Concert themes inspired costumes, table decorations and dinner menus, and tables vied for prizes. Tickets are $70/$700 per table, six premium tables per night—first come, first served. $80/$800 per table. For more information, visit hhso.com or call (843) 842-2055.